Welcome to the latest Arctic Rider blog. Its been 100 days since I last reached for my laptop to write a blog, although hopefully those how follow my Facebook and Twitter accounts will see I've been rather busy with all the follow up from my Arctic Ride Iceland. I've already had several articles posted about my ride with a few more to follow too. Also, I've been working away editing the mass of footage I captured while on the Nordic island. So far I have put together a short video of the trip as well as Part 1 of the Arctic Ride Iceland series of videos. Part 2 of 3 is on its way very soon. I've heard a lot of bikers who do year-long plus trips around the world come home with a sense of being lost after such extreme adventures, and while my rides don't see me go away for months at a time, I still get a similar sense of 'what next', how and when for my adventures. 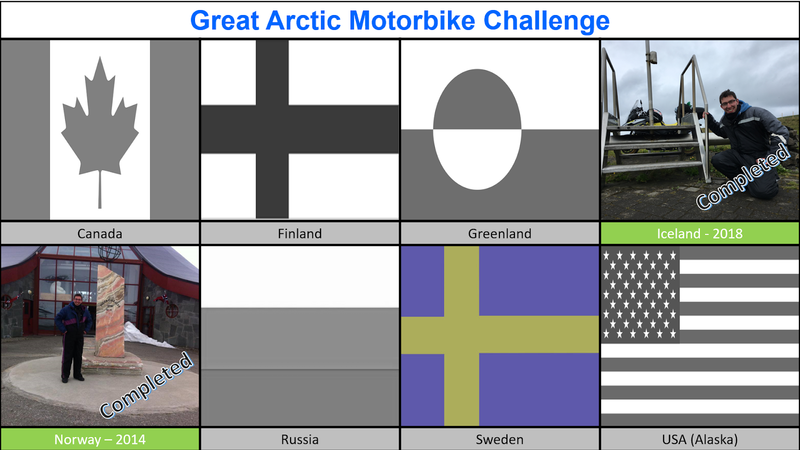 Last year I came up with the concept of The Great Arctic Motorbike Challenge, a personal ambition to cross The Arctic Circle in every country possible by motorbike (read more here) which has helped give me a sense of direction of what to do next but there are a few challenges associated with these trips. With all of my Arctic trips covering big miles the money needed to undertake and time off work and family duties isn't easy to come buy and takes me some time to save up. Looking at what I have left to do (Finland, Sweden, Russia, Canada, Alaska, Greenland) the time and money needed is only going to increase, so realizing my Great Arctic dream may start to take longer. I was fortunate and humbled to be given a brand new V-Strom from Suzuki to complete my Iceland ride on, but for me this felt like a once in a lifetime opportunity when the stars aligned to be loaned a new bike. In my garage now if my trusty GSX650F. While I love this bike, its starting to show its age (9 years) and probably only has 1 more big trip in it before heading to the retirement home. Also the functionality I need from a bike for the rest of my trips just isn't available on what is a fairly 'back to basics' bike in the current age. I need a long term successor which is more comfortable on long rides, better off-road capabilities, and something that has more 'wow factor' when I write articles and promote my trips. Unfortunately a bike like this doesn't come cheap and this is another expenditure which is hard to prioritize having a young family with mortgage, family car, and nursery fees et al to pay. I'm very proud to say that with all of your help over the past 7 years we've raised over £13,000 for two amazing charities, but I've come to the point now where I need to give everyone's wallets a break for a while. Outside of my Arctic Rides, my wife and kids have also done some amazing fundraising too, so to keep on asking folk to donate for my challenges is becoming tougher. So I'm in the process of trying to work out how to keep the project sustainable while still giving to amazing charities. As you can see from the 3 point above, while I have a plan of what rides I want to do next, making them happen is just a bit more tricky. Alongside the Alaska postponement, I'm a little more cautious about how to proceed and what to commit to next. 2020 - A combined ride ticking off 3 of my remaining 6 destinations. A trip including visits to Arctic Russia (Kola Peninsula), Arctic Finland, and Arctic Sweden. Most probably riding my GSX650F. Alaska & Canada - Due to the high cost of getting across to pond and the fact there still doesn't seem to be an insurance option for taking ones own bike, I'm likely going to have to combine these rides into one trip, take some unpaid leave from work, and smash them out one after another while on the North American continent. Greenland - What I expect to be the final leg of my challenges, getting to Greenland and the costs of renting a snowmobile is going to be very pricey. Another trip without a planned date due to the large outlay to complete. So that is my update, thanks for reading and for the continued support across Facebook, Twitter, YouTube and beyond. Peace out and ride safe. Thanks for tuning into another edition of the Arctic Rider blog. The weather in Iceland completely battered me and I feel lucky to have got through this ride in one piece, having met other bikers who been blown off their bikes in the wind, dropped them on gravel roads, and been soaked to the skin by the rain. The battle against the elements was 100% worth it though to raise so much money for two amazing charities in Tiny Lives Trust and Cerebra. 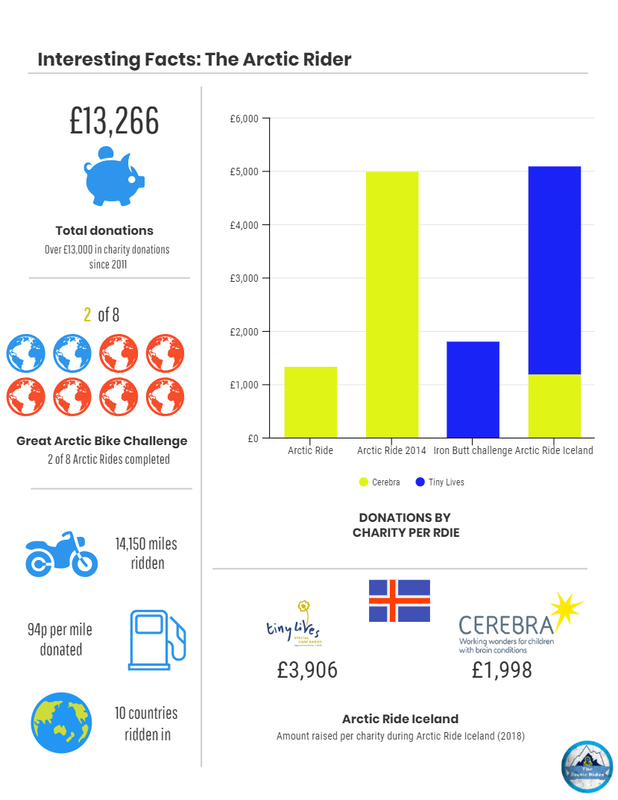 At the time of writing, Team Arctic Ride has raised OVER £5,000 for this ride. I'm honoured and humbled to have had such amazing support from so many dedicated supporters! I will be closing my donation page at midnight 31st July 2018, so if you would still like to donate then please visit www.virginmoneygiving.com/thearcticrider. Devitt Insurance who insured the bike across Europe and shared my journey all over social media. Traverse Magazine who have been covering the Arctic Rider cause. Puddle Ducks North East who supported me with donations to Tiny Lives with their water safety week. Regular readers and follows of my adventures won't need reminding that last year I had a kind of epiphany where I dreamed up The Great Arctic Motorbike Challenge. This is my person mission to cross The Arctic Circle in every country possible by motorbike. And of course each of these rides will be in the name of raising awareness for great charities. As you can see from the above chart, I've now completed 2 of the 8 countries by riding to Arctic Iceland. That leaves me 6 more, some more complicated than others. Also, I still have some very unfinished business with the Arctic Alaska challenge after the unforeseen events earlier this year which saw me cancel and re-plan at short notice and bring forward the Arctic Ride Iceland ride. So whats next for The Arctic Rider? 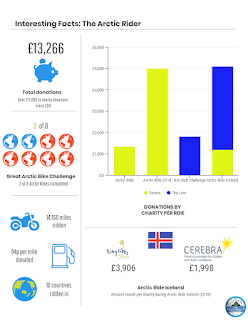 Well in the next few days I'll announce the total raised for the two charities as part of Arctic Ride Iceland, and the total for all my rides so far. Then I need to (sadly) give Suzuki back my trusty steed! However I'll be reunited with it at this year's Motorcycle Live show in Birmingham (UK) in November at the Suzuki stand. The rest of my summer is then filled with media related work. I've got a few magazine articles to write over the summer for some publications about Iceland, The V-Strom 1000 XT, and planning motorbike adventures. I also need to consume all of the videos I took on my ride and turn them into a few YouTube episodes for all those who want to see for there own eyes what you've been reading on those blogs. Finally, I need to start planning the next trip. At this stage I'm really not sure what I will tackle next or when. These trips are funded 100% by me so saving up for it, getting time off work, and getting my long suffering wife to agree to my departure all need to be considered.. but watch this space. Thank you so much for reading, sharing, commenting, buying raffle tickets, and donating. You have all made such an impact on children around the UK supported by Tiny Lives Trust and Cerebra. I owe you all a beer and some stories! Keep it real and, of course, ride safe. Day 17 - Take me home, motor-way, to a place I belong.. Welcome to the day 17 blog... my final day of Arctic Ride Iceland. Wow it’s been a blast. Where have the past 17 days gone? I started early (a theme of this trip) when I was awoken at 5am by the ships PA system wake up call. We were scheduled to arrive at 6.30am so I got up got, got myself freshened up, and headed onto deck to get some breakfast. I begrudged paying £14.99 for an all-you-can each breakfast. I like to treat myself occasions on my trips but a croissant and a cup of tea was more than enough to start the fire burning for another long ride. I got my kit packed away, left my cabin, by which time the car deck was open, so I went straight down and unstrapped the bike. I’d just finished tying my kit back onto the bike and it was time to get off the ferry. I zoomed down the ramp and back onto home soil. No sooner had I got excited to go, I sat and queued for 10minutes to get through passport control. That’s been the story off the trip.. rushing just to wait. When I finally got through posspory control (after being asked where I’d been, and where I was going to) I popped to Morrison’s next to the port and filled up my tank ready to go. It was 7am so I knew I’d hit some rush hour traffic. I decided I’d try and do 100miles then stop. I battled past the rush hour of Ipswich, Bury St Edmunds (busier than I thought), and Cambridge. I was still feeling good and when I got to my 100 mile mark I was just short of Grantham so I thought I’d try and get there. When I reached Graham I was only 30 miles away from being half way so I stretched my legs by standing on the pegs then pressed on. I got to the half way mark and thought.. let’s see if I can make it to 200miles. No sooner had I made it to 200miles then the petrol light came on. I did another 17 miles before stopping at ferrybridge services, just 110miles from home. Wow, that was a big old push to do 217 miles without stopping on a bike I tell you. My legs were burning but the VStrom is SO comfy. I could have done more if it hadn’t been for not having enough fuel. I refuelled, grabbed a Greggs pasty, and had a quick chat with some other bikers, then hit the road. Having done 217miles without stopping, there was no way I wouldn’t be doing the last 110 in one go. As I flew up the motorway the cloud set in and by time I was 40miles from home the heavens opened. I was so chuffed to be so close to home I just rode through it wit hout stopping and putting on my waterproofs. And then, I was home. 3,409 miles on the road in 17 days. 6 sea crossings, 5 countries, 100kms of off-roading, and a whole load of new friends made along the way. What a ride. Thank you so much to everyone who supported me on this ride a played a part of Team Arctic Ride. For the donations, raffles tickets purchased, likes, shares, comments, and good wishes. I couldn’t have done it without you all! And a final thank you to my wife Kirsty who; looked after our children and ran the household for two weeks, who was always on the end of the phone/text when I was feeling low, who shared every post and even wrote a few when I had no signal, and who pulled me up by my collar when I had to cancel my Arctic Ride Alaska mere weeks ago and told me to get on that bike to Iceland. Without her dedication and support there would be no Arctic Rider. And the some of the first words she said to me when I got back “That will be good practice for when you go to Alaska”... legend. That’s me logging off I hope you enjoyed reading my updates. There will be lots more to come in terms of looking-back blogs, pictures, and lots of videos, so look out for. Welcome to day 16’s blog. Not long until you no longer have to read my daily updates, haha. I awoke this morning to a first for the trip. It’s the first time that I’ve been woken up by being cooked inside my own tent. It happened a few times on my Nordkapp run but regardless it’s not a fun way to wake up. Needless to say, the sun was out and it was hot. I got the bike packed away and headed out of the campsite. I saw a superstore on my way in from the motorway last night so I headed there to get some supplies. It was only when I arrived to an empty car park that I remembered it was Sunday, doh. Being on the road I’ve totally lost track of days and dates. Luckily I’d filled my tank last night so I jumped back into the autobahn and opened up the throttle. I had an odd feeling when I first hit the road. I knew I ‘only’ had 250 miles to ride but I also had until 9pm to reach the ferry port, so I was time rich for a change. I was going to take it easy but the power of the V-Strom’s 1000cc v-twin engine, combined with the open and quiet autobahn meant I ended up pushing on at a really good rate. I stopped at 75 miles and 160 miles to get stretch my legs and grab a few nibbles of food. I then had another 100ish miles to do and thought I’d have another stop in between. However as soon as I saw the signs for Hoek van Holland (just West of Rotterdam) where my ferry departs from, I could resist bombing on and making it there in one. Having these little challenges on the road I think is what keeps me from going mad for so long riding solo. Always with safety at the front of my mind, I see how many more miles I can do even when my arse is hurting, or if I need fuel and i see there are 2 fuel stops coming up, I try and make it to the 2nd. To keep my mind ticking over, I don’t change my speedo from miles to kilometres. This way I’m always working out distances into miles and my speed when the road signs change. Sad I know, but I need to do something to keep my mind active mile after mile (or 1.609 km to 1.609 km). I arrived in HvH super early, so I headed into the town centre, pulled up at a local cafe and treated myself to some lunch. I parked the bike right outside the cafe and the town didn’t look all that safe. I had a Gouda and ham toastie (brown bread) plus some thick cut chips and a full fat coke! Yum. After being in Iceland I was pleasantly surprised when the waitress told me it was €11. That would have got me mars bar and a bottle of sparkling water on the windy isle. I tried to find somewhere to show the World Cup final but there wasn’t anywhere in the town, so I pulled up at the port check-in and watched it on my phone. By the time the footy was done I got checked in and waited to board the ferry. While I was waiting, I listened to two English chaps in the queue behind me on bicycles spend the best part of 15 minutes belittling different nationalities in a rather vulgar manner, including the Scots. For those of you that don’t know, my heritage is of Scotland, so it took all my will power not to say anything or throw their bikes into the water. Shoutout to willpower, you rock. I boarded the ferry and got my bike strapped down on the car deck. A Welsh guy on a Harley beside asked me if I knew what I was doing when strapping the bike down. I told him about the issues on the Iceland-bound ship, and the Samskip ‘duvet and wall’ method from my passage to Grimsey. I saw from his face that he wished he’d never asked so I finished with “yeah I’m good man, thanks”. I got to my cabin, dumped my gear and had a look around the Stena Britannica, which takes me to now, writing this blog. So all I have left to do now is the final sea crossing and then ride the 320 miles back to my house to see my wife and kids. It’s been an amazing trip although slightly frustrating with the number of hard milestones (mainly) ferry’s which has meant I’ve been rushing only to end up waiting a lot too. Wow... somehow we’re on day 15 of this trip. I’m not sure where the time has gone.. it only seems a few days ago I was rushing down to Harwich to catch the ferry on day 1. Finally we were allowed into the car deck to unload but it was another 30minites before I finally rolled off the ship. I made the wise choice of staying in my ‘shop clothes’ for as long as possible. Some of the other bikers were all kitted up and were just about boiling by time we got off the ship. Knowing I had about 650 miles to cover before end of day Sunday, I really wanted to put some big miles today, even though I was starting early afternoon. So I quickly navigated my way out of Hirtshals and onto the motorway where I could eat up the miles. It was so odd being back in ‘civilisation’ after 12 days away at sea and in Iceland. Traffic, warm weather, petrol stations that arnt just unmanned outposts, and motorways seemed so strange for the first hour or so. My plan was as a minimum to get out of Denmark and at a push make it to the Netherlands. With the limitless speeds out the autobahns on my side, in the end I managed to do 400miles stopping around 8pm just south west of Bremen in Germany. By doing this id managed to navigate past Hamburg (which is super busy at all times it seems) and countless roadworks on the Autobahn 7 & 1. That leaves me about 250 miles to do tomorrow before I catch my final ship, back to Blighty. I found a nice campsite on side of a river. Although when i arriveed and asked if they spoke English, in German, I was greeted by huge laughs from a guy behind reception and an unimpressed look from the cashier. I then said I could try in German if it was easier but they just carried on in English. I really do try when I’m travelling to learn some phrases and words but also know my limitations. I did think it was a bit much to be laughted at though. Nevertheless I’ll keep on using my current approach as it seems to work most of the time. I got to my camping spot, put up my tent, and cooked some pasta with pesto and ham. It was lovely. So that’s day 15 over. Only a few more days and I’ll be back home and this whole trip will seems like a dream, no doubt. Thanks as always to everyone for their support and continued reading of these blogs. Also thanks to all the great new people I’ve met on this journey so far! I know some of you have now joined the blog reads, and it’s been a pleasure to meet such kind and interesting folk along the way. Welcome to another edition of the Arctic Rider blog. I awoke early to the sound of my alarm. I was determined not to sleep in as I had to be at the port by 8am to check in for my ship to Denmark. As I packed up the tent, I got chatting to a couple of other British bikers who’d been touring around Iceland for a few weeks and were on their way home. As it turns out one of them lives in Gosforth, about 5 miles from my house! After barely hearing another native British accent (apart from my ship buddy Jon) I bumped into a Geordie thousands of miles from home. We chatted about how bad the weather had been and they told me how both their bikes had been blown off the road in the West Fjords and they were rescued by some Icelandic truckers. Luckily they escaped major injuries but their bikes had taken a beating. I think I got lucky that I didn’t have a serious incident during my trip. I got packed away and rode the few hundred metres from the campsite to the ferry. I was frustrated to fine the motorbikes would be boarding last. I managed to pass the time by speaking to a few others bikers and taking one last looks at the Icelandic scenery. Before long it was time to board the ship. I got a bit more space this time but the straps and availability of places to tie the bike down to where very limited as per my outbound journey. A few Swedish guys gave me a hand but we were all equally worried about our bikes. I got onto deck, found my shared ‘cabin’ and laid my stuff out before heading out into the open deck to say bye to Iceland. It’s been a really emotional visit to Iceland. I wholly underestimated the conditions and faced my riding fears head on, not only with the weather but gravel roads also. I’m also proud I came out the other side. It’s true what the say, it’s the journey that makes it, no the destination (although that’s also pretty important for an Arctic Ride). With another 2 days onboard ship, I took to grabbing some tasty lunch (Icelandic sausages, potatoes, green, and sauce), charged up my devices, and backed up my media. Then I spend the rest of the night writing my blog for day 12 and trying to post it! (Sorry for the delay). Day 14 started at 3am. The ship was docking the Faroe Islands and I can only presume that my ‘cabin’ was next to the bow thrusters as the noise sounded like an Apollo mission take off. Alongside that, and new passengers coming aboard and making a lot of noise, I didn’t get my head back down until about 4.30am. I managed to sleep until about 6.30am before getting up and having a cup of tea and looking out on the ocean. Today has been a mix of podcasts, eating, lisenting to music, starting to write articles for my media commitments back home, and FaceTiming the family. There is a gym and small pool onboard, but after 2 weeks on the road not eating properly, I’m keeping my energy for the 1,000 miles of motorway that awaits me when I roll back into mainland Europe tomorrow. As I write this blog I’m looking out over the North Sea knowing, as the crow flies, I’m just a few hundred miles from Blighty, but I’ve still got a lot of riding to do. That’s all for today folks. As always thanks for reading and for being part of Team Arctic Rider. Thanks for tuning into my Arctic Ride Iceland blog, riding my motorbike to the Arctic Circle to raise money for Tiny Lives Trust & Cerebra. Day 12... wow. What a day! I started the day waking up inside a national park and a stones throw away from a glacier, where I’d camped last night. I wasn’t in the mood for breakfast so just grabbed an apple and started packing up my gear. I was on the road early knowing I had a long day ahead of me, with over 250 miles (a long way on these roads) to do to get me back to the port where I’d catch the ferry tomorrow morning. The scenery along Iceland’s south coast (just like yesterday) was again truly stunning! You almost get immune to how beautiful it is as it’s constant. From one mountain range to the next, it’s just epic. I stopped a few times to snap some photos, then I pulled into the ‘Iceberg Lagoon’ on recommendation of Olafur. Wow. This place was even more remarkable than the rest of South Iceland. It’s like a different world. I carried on East eating up the miles. I stopped at a small services where I ordered a panini, only for it to be burnt in the toaster. I ate it anyway as it was the last one they had and they gave me a refund, cash-back! With about 100miles to go the road turned to gravel once more. The first section was also roadworks and the road was filled with deep and heavy gravel. I really struggled riding on this kind of terrain and I had to take it really easy to make sure the bike and I got across in one piece. After a few kilometres the gravel eased and it become a more ‘regular’ unpaved surface, so I was able to pick up some speed while riding on the pegs. Apart from the odd gust of wind, the weather really picked up today and I got to enjoy the roads and in relative warmth, although my all-in-one rain suit stayed on, so I’m not sure it was actually ‘warm’. I made it to the town of Egilsstaðir in East Iceland in time to do some quick shopping, and catch the England football semi-final. Alas it was not meant to be but the locals made me really welcome, even if most were rooting for Croatia. After the game I started the ride over to the port-town where I’d camp for the night. Due to the Northerly nature of Iceland, it was still super bright even though it was past 9pm so I was able to stop and get some shots at the top of the mountain pass, and stop at my last waterfall (this time with no other tourists) before getting to the campsite and settling down. Aside from crossing The Arctic Circle, this was definitely my best day in Iceland and I leave with a good taste in my mouth. This country is nature in its rawest form and, put simply, is stunning and wild. I’ve loved seeing the sights of South and East Iceland and finally riding without the wind trying to take me out. I’d highly recommend anyone come and visit, but bring warm clothes and a wind break. Tomorrow I set sail for Denmark (I was meant to visit the Faroe Islands on the way home, but change of plan) and then have another 1,000 or so miles before I get back to Newcastle. Thanks you again to everyone for the support, messages, and donations. It seems like ages ago that I crossed the Arctic Circle, but my journey is still far from over. You can still donate at www.virginmoneygiving.com/thearcticrider after some very generous donations we’re now closing in on £5,000!! Super effort from everyone.